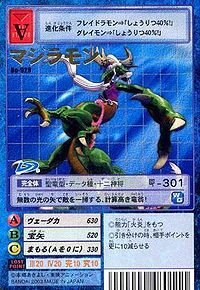 Difference between revisions of "Majiramon"
One of the "Deva Digimon", it is a Perfect Digimon with a form resembling the Dragon. 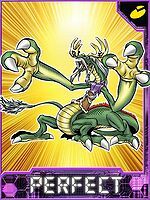 As a follower of the Four Holy Beasts Digimon Qinglongmon, it is extremely calculating and hates to even lift a finger if it won't benefit itself. However, if it realizes that something will benefit itself, it will want to poke its head in no matter what the thing is. It has a habit of putting a price on everything, and expressing various matters by their cost in money. 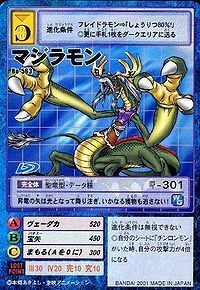 During battle, it shoots through the opponent with the Bǎo Shǐ, which are the hairs of its tail and whiskers transformed (Incidentally, one Bǎo Shǐ is worth ¥5,000). 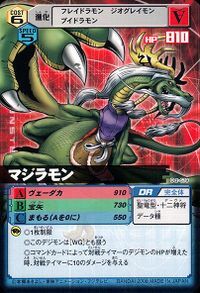 Its Special Move is disappearing into the center of a swirl of light summoned in the sky, then firing 108 shining Bǎo Shǐ, burying a horde of opponents in just an instant (Vedhaka). It possesses ¥540,000 worth of destructive power. 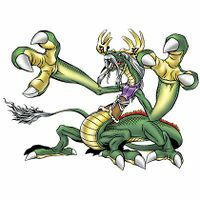 | Majira (「マジラ」 Majira) is one of the Twelve Heavenly Warriors of Buddhist Mythology. Anime/Manga Digimon Tamers: "Enter the Digital World! Goodbye to Our City"
ヴェーダカ Vēdaka Vedaka/Flaming Arrowheads Disappears into a swirl of light in the sky from which it fires 108 shining Bǎo Shǐ, or breathes flames from its mouth. Bǎo Shǐ  Treasure Arrow 宝矢 N/A Treasure Arrow Fires the Bǎo Shǐ it creates from its hairs. Majiramon is a boss Digimon, found at "Majiramon Nest". 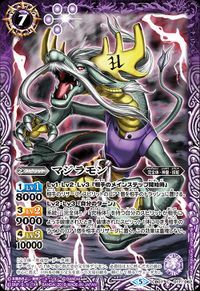 Majiramon can only be obtained as a collectible card. 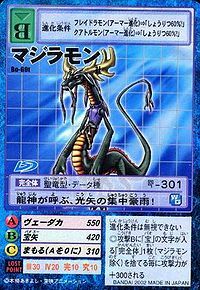 Its card is part of the Deva (十二神将（デーヴァ） Jūnishinshou (Dēva)) set and the Qinglongmon's Subordinates (チンロンモン配下 Chinronmon Haika) set. Majiramon is available as a Digimon Medal. 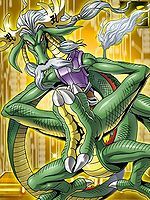 The cunning leader of a divine dragon race!! This rising dragon's arrows turn to light and rain down, not letting a single prey escape! This calculating old dragon sweeps enemies with countless arrows of light! This dragon god summons a downpour of light arrows that concentrate on one spot! One of the "Deva", it is a Perfect Digimon with a form resembling the Dragon. 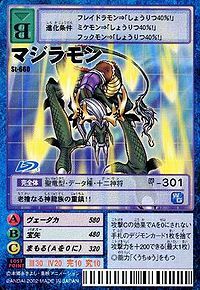 Its Special Move is disappearing into the center of a swirl of light summoned in the sky, then firing 108 shining Bǎo Shǐ, burying a horde of opponents in just an instant (Vedhaka). ↑ Internet Sacred Text Archive, retrieved 08/31/07; Vishnu Purana, Ch. VI: "The maker of arrows is sentenced to the Vedhaka (piercing) hell."